It is possible to find the wild Spanish mustangs along much of the beach from Corolla to Carova. But most of the nearly 11 miles of beach from the ramp at Corolla to the Virginia line at Carova looks pretty much the same. It is very difficult to know where you are. There are very few distinctive landmarks to go by, and there simply are not any road signs other than some hard to spot mile markers. You will quickly find that having some frame of reference to judge your location relative to the Corolla ramp or the Virginia line will bring you peace of mind. You should be mindful of the tide when driving this stretch of beach. Depending on the time of year and the weather, high tide can come very far up on the beach, near the dunes, putting you in deep loose sand with little room to drive. Being able to judge how long it will take to reach Carova or Corolla is extremely useful. Remember, driving along the beach is a lot slower than on the open highway, and you must take that into consideration when judging distance and time. The seemingly short eleven mile drive can often take from 30 minutes to an hour. Refer to local tide charts to plan your best opportunities for traveling along this beach. At times low tide opens much of this beach to a very wide and hard packed surface, reminiscent of Daytona Beach. At other times, even low tide will give minimal berth, and you must grind your way for miles in soft sand. Also keep in mind that there are no public facilities north of Corolla. No stores, no gas stations, and no public restrooms are to be found. 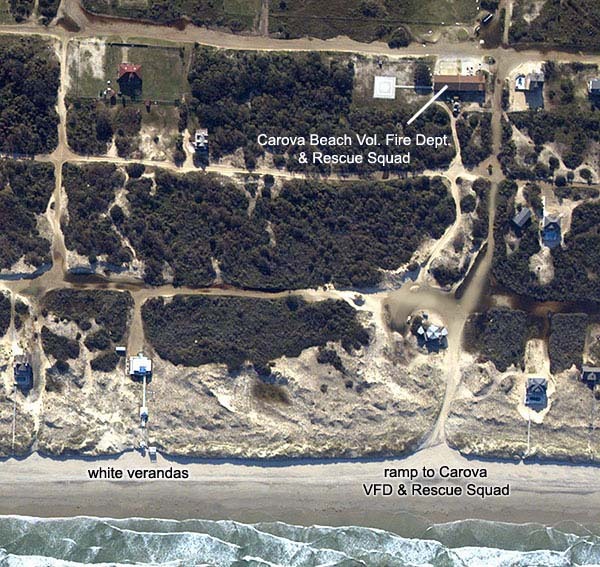 The closest thing to a public facility is the Carova Beach Volunteer Fire Dept. and Rescue Squad, located back off the beach between MM21 and MM22. 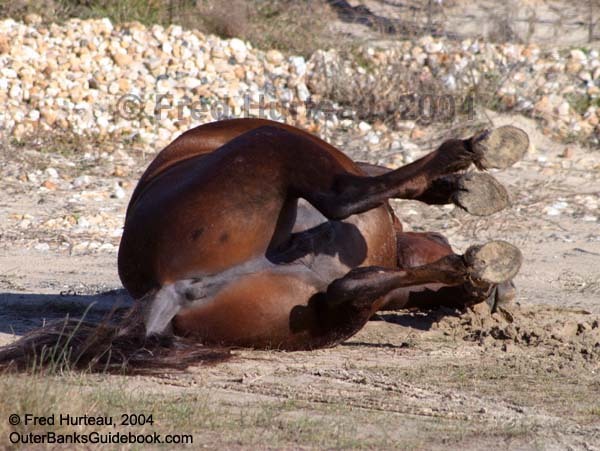 There is one other hazard you should be aware of that you won't find on most beaches. There used to be an ancient maritime forest where the beach is now. The salt water has preserved many of the stumps from that ancient stand of trees. Sometimes they are mostly covered by sand. At other times the sand is carried away and they are greatly exposed. These are visible at low tide, and can be far enough up on the beach that they could be driven into. These stumps are easily visible in daylight, but may not be so obvious at night. Just be aware that they are present in several places, especially along the southern end of this beach area, and be sure to avoid them. 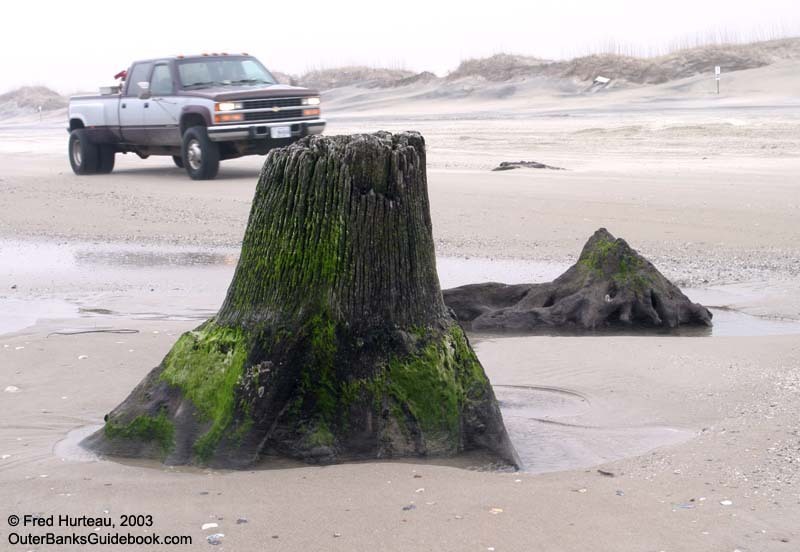 You can read more about this phenomenon at "Stumps In The Surf". These landmarks are measured in "miles north of the Corolla ramp" or "NoCR". The list at right provides some information and locations of markers you might find useful, but a couple of these mean little without the photos associated with them. Keep in mind also that the "mile markers" and the "miles North of the Corolla Ramp" (noted as "NoCR") do not correlate with each other. It is unclear just where the distances on the "mile marker" signs are measured from. You can only use the mile marker signs as a relative location, to calculate your distance from any of these other mile markers. The first interesting sight you come to north of Corolla is Penny's Hill. The problem is it's not visible from the beach. 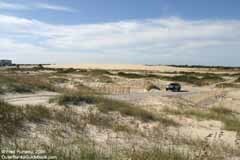 This large dune is located at Mile Marker 15, where there is a ramp. But this ramp is marked private, and leads to a large home (far left in photo) in front of Penny's Hill. Penny's Hill appears to be the largest unvegetated dune north of Jockey's Ridge. The road in this photo leads left to the first ramp north of MM15. Just 200 yards north of MM15 is another ramp closest to Penny's Hill, and then another ramp 200 yards north of that one. Either of these will let you navigate the paths back southward to reach the location shown in the photo. These ramps and roads are clearly visible in the NOAA aerial photo below. It is not clear whether Penny's Hill is private property, or only next to private property. You cannot drive on this dune, but it might be possible to hike it. Approximately one half mile north of Penny's Hill and Mile Marker 15 is the first obvious landmark on your way north. Three beach homes sit at the dune line where they jut out onto the beach. At high tide you have to drive around behind these houses to keep out of the surf. 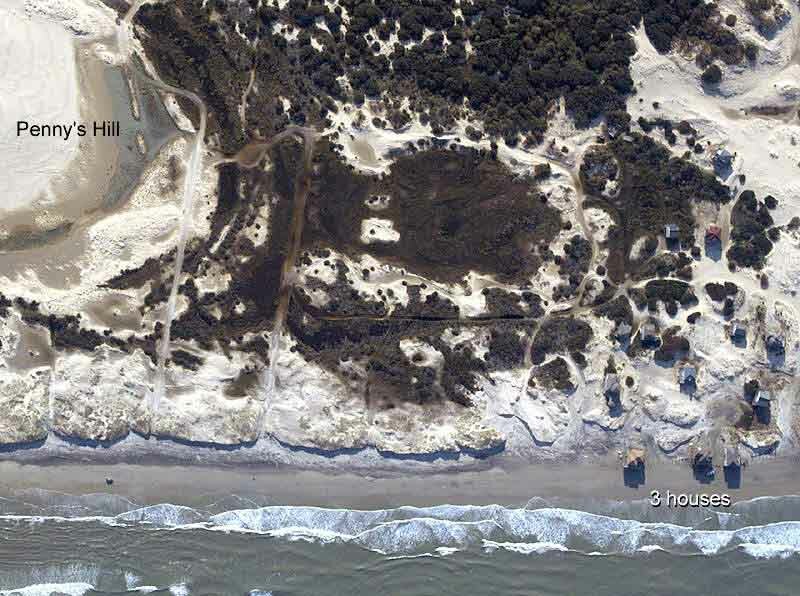 The NOAA aerial photo at right shows the three houses on the lower right of the photo (look for their shadows on the beach) and Penny's Hill to the upper left. Continuing two more miles north up the beach you will reach the next major landmark. 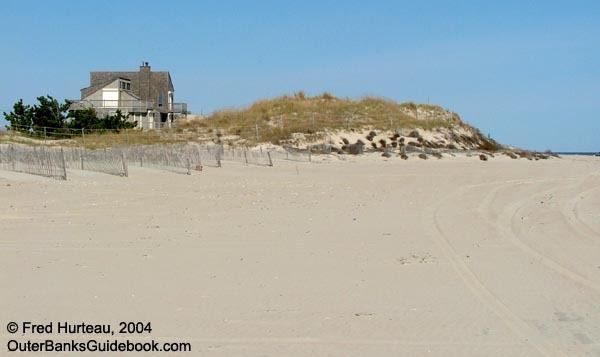 A large vegetated dune projects out onto the beach with a house behind it. 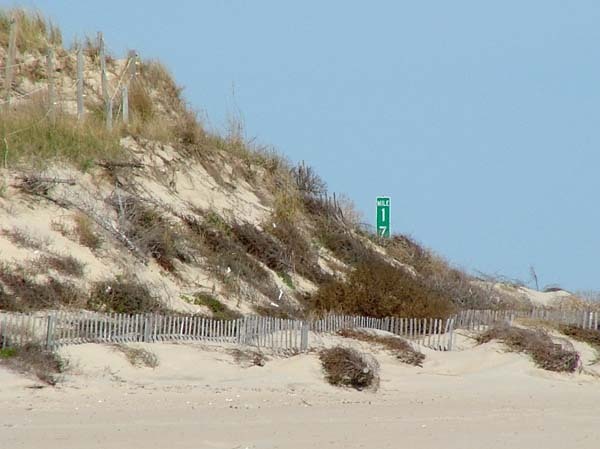 The eastern base of the dune nearly hides the Mile Marker 17 sign. You can't miss the dune, but you can miss the marker if you don't look carefully. The next easy to spot landmark is the watchtower pictured at right. 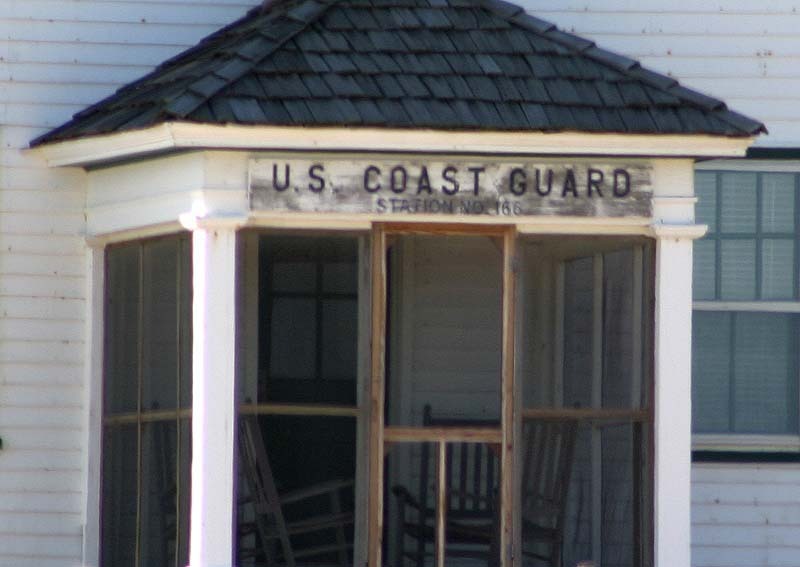 It sits in front of a building marked "US Coast Guard Station No. 166", which is located about seven miles north of the Corolla ramp. From here there is only another 3.8 miles to the Virginia line. This is one of several places along the beach where high tide can reach well up to the dunes, as evidenced by the dark color of the damp, packed sand in the foreground of the photo. 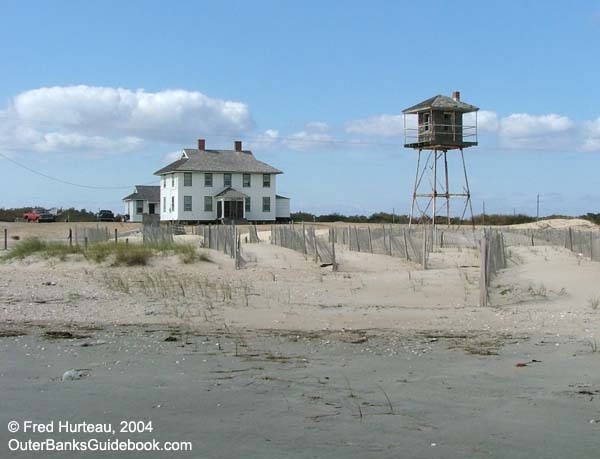 The last easy to spot landmark is a pair of bright white verandas, or gazebos, and a boardwalk out at the dunes. These belong to a house that is 8.3 miles north of the Corolla ramp. 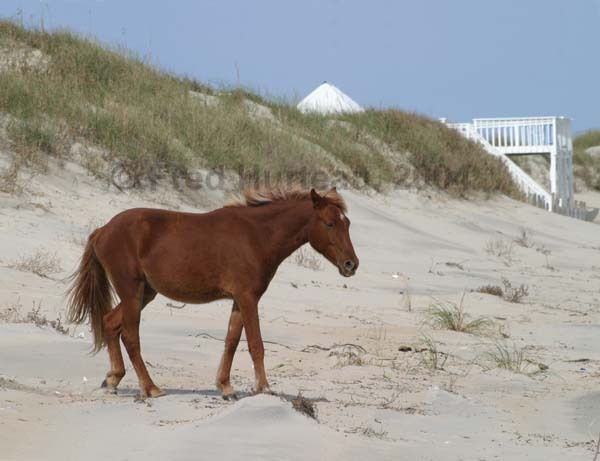 Once you reach this area, you are getting into prime wild horse territory, as evidenced by the photo of this colt with the white boardwalk steps in the background. Another 250 yards north of this landmark is the ramp leading to the Carova Beach Volunteer Fire Dept. and Rescue Squad. Both can be identified in the aerial photo from NOAA linked at right. This ramp, or any ramp north of here will take you into Carova. There is a good chance you will find wild mustangs grazing almost anywhere in the area between this ramp and the next four ramps northward. You don't really have to worry about getting lost. You can't go very far in any event. If you come to a dead end, just turn around and go back. The roads generally run in a north/south - east/west grid, with frequent crossroads. You can always work your way east until you reach a beach ramp. 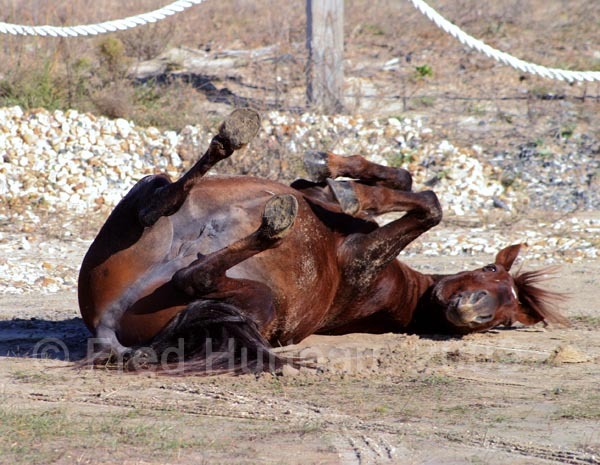 This mare stopped as she was strolling by the camera and took a roll in the sand, then rolled onto her back and stared at the camera as if to say "Well, is this cute enough for you, or what?" 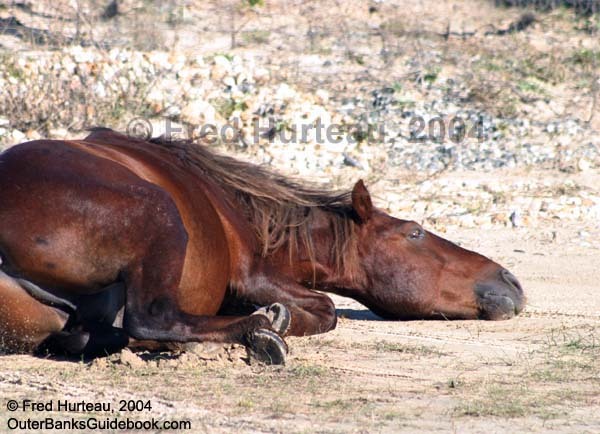 Though the author had good luck finding horses in the area of Carova, that is not to say the horses cannot be found south of Carova. 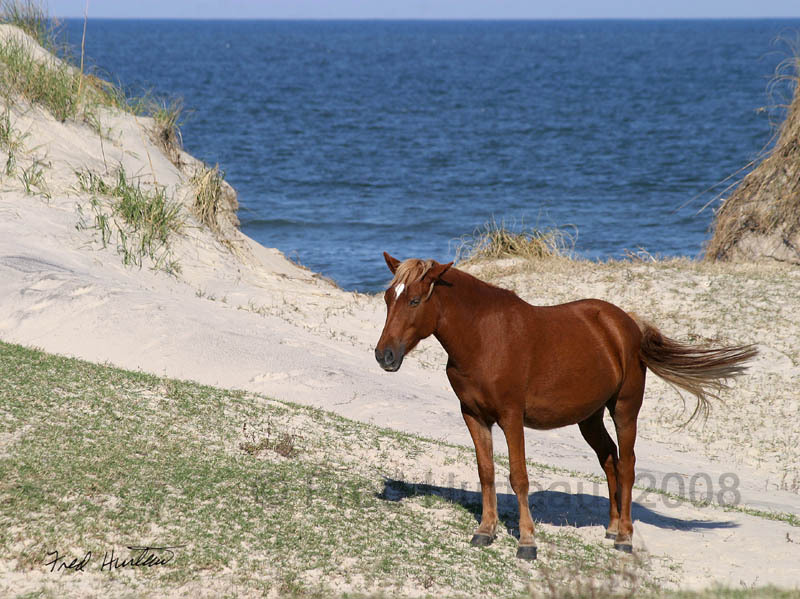 They range from the Penny's Hill area northward, and are sometimes seen walking up or down the beach along the surf, or grazing on the dunes. With a little planning using the information given here, and a little luck, you can see these wonderful wild horses for yourself. This site uses GPS coordinates where applicable, displayed in red in the decimal degrees format (hddd.ddddd°). 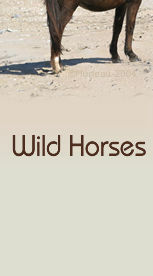 You can download my KMZ file and explore all the wild Spanish mustang areas the fun way.